We have many different types of companies using Greenlight Guru to help them create a compliant quality management systems that allow them to focus squarely on quality - sometimes even companies who don’t specialize entirely in medical devices. This is the case with Priority Designs, an industrial design consulting firm based in Columbus, Ohio. They specialize particularly in design and cover a range of industries, including medical devices, but they are not medical device manufacturers. Priority Designs is a product development design consulting firm, specializing in research, human factors, strategy, prototyping and brand development. They have been in business for about 30 years and have designed everything from medical devices to sporting goods. They've designed truly innovative products for some of the most well known brands in the world like Nike, GE, TaylorMade and more. They have the ability to prototype rapidly and a design team who can iterate quickly. Their workshop space is designed for rapid development of new products. Currently, there are about 65 employees. They’re not the manufacturer, but did the early prototyping, conceptualization and development work on the Q Collar, a medical device worn by NFL All-Pro Luke Kuechly a device to protect against mild traumatic brain injury caused by concussive events. Customers will come to them with a problem they need fixed and they will design a fix. The company has also completed a number of surgical instruments and dental products. While Priority Designs has done a number of projects in the medical device field, they felt that they weren’t getting the work further up the design phases as they didn’t have the knowledge or ability to take a product through the full process and turn it over to manufacturing. Potential customers would often ask them whether they had any ISO certifications and a quality system in place, but they were having to say no. They realized that they needed to get these things in order to bring those extra projects onboard. This made them look for a solution to help them win more of this medical work, which eventually brought them to Greenlight Guru. The whole idea was to find structure and a quality system in order to have the records and create a design history file. The team was doing the right things; however, they weren’t recording what they did and weren’t aware of the regulations around record-keeping for medical devices. 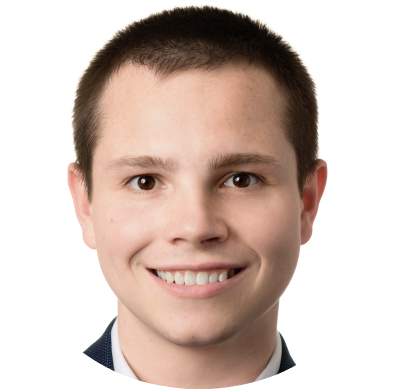 Senior Medical Design Device Specialist, Reade Harpham, found Greenlight Guru online. He was looking for intuitive software, with good customer service that would meet their requirements for a medical device quality management system. He discovered that several similar companies were using Greenlight Guru, which was a prompt for him to look further into it. The decision to go with Greenlight Guru's software came down to the simplicity of the system. The whole QMS was totally new to Priority and they didn’t have anyone with experience. They definitely did not want a paper-based system as that would be difficult to setup and manage. 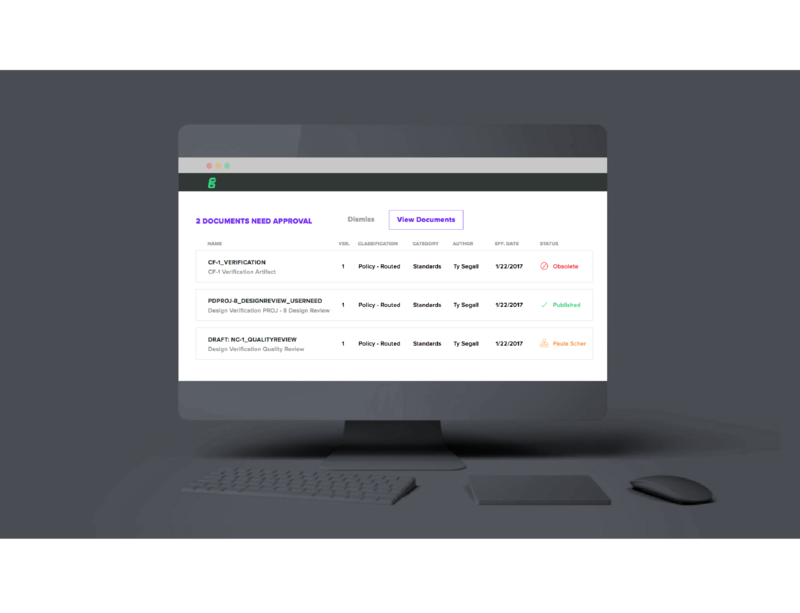 When Reade looked at Greenlight Guru, he felt that the simple interface would make it easy to bring new team members up-to-speed with requirements for medical devices. Donna had come from a consulting background and had just began with Priority in time for the implementation of Greenlight Guru. Not all of their projects involve a quality system, and it was important that the system they put in place be lean and not add any large burdens to the company as they move very fast on projects. Implementation went very smoothly, and Donna met with the Greenlight Guru Customer Success Team once per week to get training on all the medical device regulations and their new quality system. They also purchased Greenlight Guru's audit-tested templates as they knew they wanted to be ISO 13485:2016 certified as quickly as possible. Together, they devised a plan of attack to implement and had all QMS documentation customized, uploaded and ready within a few months. In the past, Donna had been part of implementing a different electronic system at another company. She found that it was very difficult to use and challenging to implement. As a result, people didn’t understand it and really didn’t use it. She describes Greenlight Guru as “so much better” and a well-rounded system overall. As they went through the implementation of Greenlight Guru, they made sure everything was set up specifically to be certified. Priority conducted internal audits and ran a couple of projects through the quality system to understand if it’s working correctly or if anything needs changing. Two members of the Greenlight Guru Customer Success Team came out on site at Priority Designs to help Donna go through audit requirements and get talking points correctly drilled down. She also gained an understanding of the priorities of auditors. This helped Priority to be very prepared for the first audit in October 2017, around a year after having turned on Greenlight Guru. The software proved to be a great help during the audit. The first one was a virtual audit, just of their documents. All Donna had to do was go into the Greenlight Guru software and download the documents to send. She knew exactly where everything was and could easily find and send required documents. It was also helpful for the December audit, which was conducted on-site, as they could show the auditor exactly where everything was and provide a clear document trail. He was particularly impressed with the clarity of the design controls. Customer service and the validation pack provided by Greenlight Guru worked very well for Priority. It allowed them to easily show that everything was validated and working properly as per the regulations. This was also impressive to the auditor. Greenlight Guru had done most of the revalidation paperwork for them automatically, which saved a lot of work. Donna has found that internal audits are also a breeze. Staff complete the training and are then able to easily access the centrally-located documents in the system. Priority is using the Greenlight Guru software to manage its QMS as a whole and deal with any adjustments of documents. Donna is the quality manager for any project that goes through. She controls deliverables, training and project plan through the software and uses it to regularly upload and keep things current. 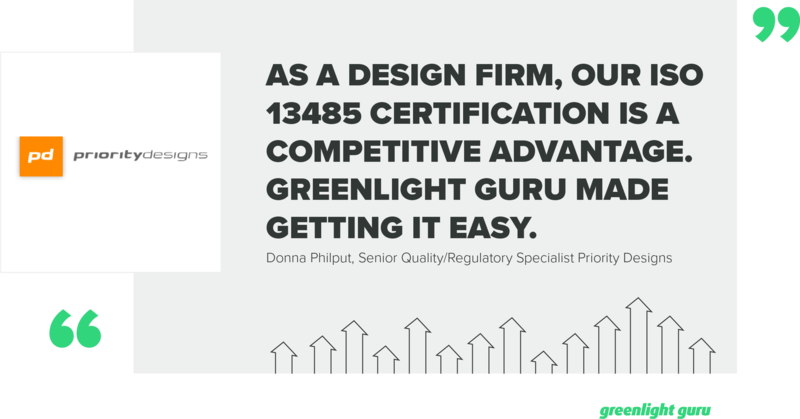 Greenlight Guru is helping to give a competitive advantage, by facilitating a compliant quality system that allowed them to easily gain ISO 13485:2016 certification. 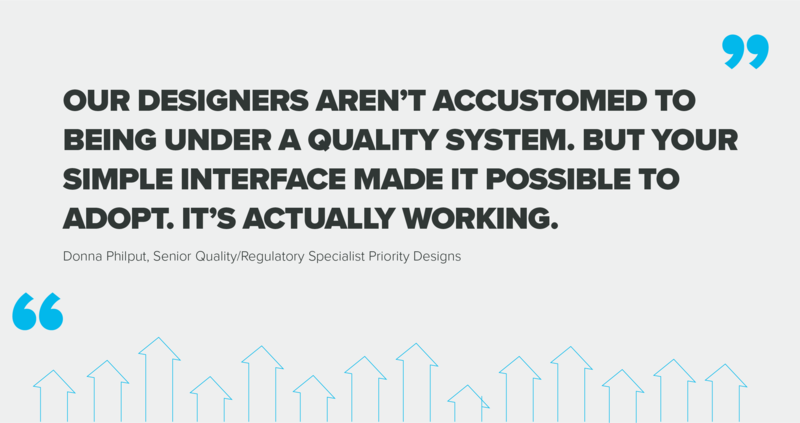 A medical device specific quality system may seem unusual in a traditional product design firm as it’s often out of the realm of creatives. Having the ISO 13485 certification gives them an edge over competing design firms for those medical device projects. This goes to show that there is a good case for Greenlight Guru among design firms who take on medical device projects, even if you’re not actually manufacturing those products.